Set fees or discounts for WooCommerce payment gateways. This plugin is a premium version of free "Payment Gateway Based Fees and Discounts for WooCommerce" plugin. Another option lets you set fees/discounts based on customer’s country (include or exclude). Additionally you can set which product categories should be included or excluded when calculating the fee. Additionally you can choose if per product percent fee/discount is applied to the whole cart or only for current product. Also it’s possible to set if per product fixed fee/discount is applied once or by product quantity. To set discount instead of fee, just enter negative value for fee value. You can set different fees to be added for customers from different countries for same gateway. You can do that by using “Main Fee” and “Additional Fee” – each fee has its own “Countries to include/exclude” options. You may also want to add fixed value for both fees – this can be done by using “Global Extra Fee” (in “WooCommerce > Settings > Payment Gateway Based Fees and Discounts > Global Extra Fee”). Set PayPal “Main fee” to 2,9% and set “Countries to include” to “USA”. Set PayPal “Additional fee” to 4,5% and set “Countries to exclude” to “USA”. Enable “Global Extra Fee”, set it to $0,35 and set “Exclude from gateways” option there to all gateways except PayPal. If you have “Payment Gateway Based Fees and Discounts for WooCommerce Pro” plugin version below v2.5.0 – you will need to update plugin manually by downloading it from your account page at https://wpfactory.com/my-account/downloads/. After that updates will be done automatically with WPCodeFactory Helper plugin. Most complete payment fees plugin for WooCommerce I’ve found. Thanks guys! Just downloaded and tested. Realy nice interface and looks usefull. But one thing that stop us. We have 2 different VAT values by our products. some have %18 and some have %8. If we choose for example %18 in the plugin for referenece, the VAT of goods with %8 VAT is calculated form the list price and not from the discounted unit price which is wrong. If you correct this please soon, we are ready to purchase. The plugin doesn’t work anymore after the last update. Using php7 on the latest wordpress + woocommerce, plugin did work fine before. Please update to v2.2.2 – this should be fixed now. Hi! the plugins calculates the fee but is not adding it to the checkout. Works great! I thought the plugin was broken, but realized that I needed to set up BOTH the payment gateway (PayPal) fees AND the general options in order for it to work. Would be lovely if the documentation was updated. Thank you so much for your work! The plugin functionality is very good, but it slows down our site tremendously. This plugin was working well, but recently it started listing our convenience fee twice. Deleting and reinstalling didn’t fix the problem. Nothing obvious shows up in the code or database. In case anyone else has similar issue – as we’ve figured out in private emails, this is some compatibility issue with “Simple Sales Tax” plugin. BUT, if the customer is using GUEST CHECKOUT then this is not working. Please can you look into it, for us our most of the orders are from GUEST USERS only. In case if anyone else had similar issues – as we figured out in private emails – the problem was actually not in logged/unlogged users, but in incorrect “Coupons rule” option configuration for the fee. This thing is perfect, however we use dynamic pricing plugins does this offer dynamic pricing 1-20, 50-100 100+ (for example) or do any dynamic pricing work with it out of the box? Thank you for appreciating our plugin. Can you please let us know which dynamic pricing plugin you are using on your site? From our plugin, dynamic pricing is currently not possible only the fix fee value is possible to add for the respective payment method. We have yet not tested our plugin with any dynamic pricing plugin which we would recommend you to use. Can you please let us know your requirement as how the dynamic pricing should work and based on what rules? This information would help us in understanding your requirements and see how we can include it in our future releases. 61 thoughts on "Payment Gateway Based Fees and Discounts for WooCommerce"
I have a problem with an error message: Transaction refused because of an invalid argument. [L_LONGMESSAGE0] => Item amount is invalid. I enabled Austria, Germany and Switzerland in the shop. The plugin is configured to change the price from 29€ to 25€ if somebody is from Switzerland and will pay by PayPal. Works great but I can’t finish checkout procedure. I use the latest WooCommerce, WordPress and Plugin Version. Hi Need Help on setting up. I’m not completely sure I understood you correctly, but I think what you need is to set fee “Type” to “Percent” and “Value” to “3”. And at the bottom of the fee settings page, you can find “Taxes” options. There you need to enable the checkbox and set “Tax Class” to 6% tax class. Tax class needs to be created before that (you can do it in WooCommerce > Settings > Tax). Again, I’m not sure, but maybe alternatively you can just set fee value to 3.18% instead if 3% (and do NOT check the “Taxes” checkbox). That is: 3 + (3 x 0.06) = 3.18% But I think the first solution is more “correct”. If i have product on sale (with a discounted price) do this apply the discount again over them? or is a way to bypass already on sale products (do it do not apply double discount). Anyone know if this plugin works with PayPal Express? I enable the option, but it does not work. I am using WooCommerce subscriptions. I charge a credit card / fee. When the bill is processed it shows 2 credit card fees on the invoice. The plug correctly only charges once, but the fee is shown twice? I have installed the Free version and noticed when manually raising an invoice, this plugin does not add the fee depending on the payment gateway choice. Is there a fix for this as customers will pay using the wrong gateway leaving us in cashflow issues. There is a bug in the plugin. I have configured plugin to add a percentage of fees for a specific payment gateway. Suppose the payment is declined by the user from the Payment Gateway page, it will redirect to woo commerce site telling order received. If the user go to My Orders, he can see the failed order. If he click on Pay button, it shows the checkout page, but this time the fees are not added to any of the gateway as configured before. Hello, the free version works great but the fees that i created for Cash on delivery in the summary orders of Woocommerce is added to the net amount of the products sold and i need it to be addeded to the delivery costs. How can i solve? There is someone in this support forum????? I noticed that in the plugin description it states that it can be used with PayPal. However, I am not sure if it would be inline with PayPal User Agreement where they state that there should be No surcharge. I’d like to set one payment gateway to a 100% discount, resulting in a zero value subtotal. However, when I do this the other gateways and radio buttons disappear and force the customer to checkout with the currently selected gateway. With multiple gateway options on my site, I want my customers to have the option to click through each one to review them before placing the order. This only happens when I set the discount level to 100%. Do you mean that “PayPal 0,35 EUR” fee shouldn’t be added twice? If that’s correct – could you please let me know if you are using “global” fees (i.e. for all products), or fees on “per product” basis, or both? We’ve just released new v2.3.2 – could you please update and let me know if the issue is still there? Could you please update plugin to v2.3.3 and let me know if this is fixed. Thanxx, now it works fine! My fees are being added in twice. Is there any way to fix this? We want to create a coupon that allows some customers to bypass the fee we have set (3% when using credit card). However, since the coupons take effect before the fees, it never matches up to the right amount (the 3% in your plugin is adding 3% to the post-coupon amount). What’s the best way to bypass the fee for some customers that we select? I am very interested to buy this plugin however I need one function which is to enable/disable based on user role. If that feature is available then it will be a complete plugin for me. Hi there, I’ve installed Ver. 2.3.3 and would like to use it for a cash discount of 2%. I ticked the “Add Taxes” checkbox (Add taxes to total cart sum, when calculating fees. ). Here in Germany it is common use to deduct cash discount from the total sum (incl. taxes). I made a test purchasing on my dev site. Total was EUR 33,50 (incl. taxes). 2% cash discount is 67ct, which was calculated correctly by the plugin. But for some weird reason the total is not 33,50 – 0,67 = 32,83. It is 32,74! Please see the enclosed screenshot and see for yourself. I have no idea what’s going wrong here. in order to add transaction costs in case of certain payment methods (e.g. MasterCard and Maestro). However, when someone *first* selects to pay by Card (= extra cost) and *then swaps* to Direct Bank Transfer (free), the extra costs do not disappear. hello, i’ve bought the pro version of “Payment Gateway Based Fees and Discounts for WooCommerce”, in particular the lifetime license for unlimited sites. i downloaded the .zip file and, following the instructions, i’ve installed it via FTP. Now the name that appears in my dashboard is “Payment Gateway Based Fees and Discounts for WooCommerce Pro”, but the pro features still don’t work. What can i do? Hi, I can’t translate the Fee title using WPML. After save Payment gateway few times, it still not show up on WPML string translation. I would also like to know hot to translate Fee Title if I use WPML? I want to enable a payment (cash on delivery) only in our country. Is it possible with this plugin? However, the help of that section says that that section is to disable the fee or discounts. I can’t use Cash on Delivery payment gateway if I enable this plugin. I dont know why but the option to pay Cash on Delivery will be hidden if If enable this plugin. The other payment options are there but the COD not an option, I set up everything correctly and works on other website, but not here on ny new site. All updated, Woo and WP and Plugin. I use othe plugins for Woo, can it be plugin conflict? If i turn of this plugin the COD payment option is there. Do I have to purchase the pro to get this option to work or what is the problem? Thanks a lot! Okay, I solved the problem somehow! Thanks. I installed your Payment Gateway Based Fees and Discounts for WooCommerce plugin, and I want to buy it, but I have one issue. Instead of displaying a distinct fee, I need that the prices displayed for each product is updated (cart, order), according to the percentage associated to the payment method. I would like to display a third price in the product detail page in order to show the price depending on the payement method. Hi, can i have a fee based on the number of the instalments? I have a payment method Alpha bank in which I want to charge a fee based on the number of the instalments. HI i have added a credit card fee, but now i am always getting 2 lines displayed (credit card fee and credit card fee#2) in the checkout – although only one fee is configured (additional fee(optional) is empty. Giving the optional fee the same name is also not merging the lines as indicated in the help ? note. Please advise. Also is it possible to setup a fixed minimum e.g. 0.30 and an additional % value e.g. 1.5 % on top ? combined in one line ? Maybe it’s possible to create/share an admin account, so I could login to your server and check what’s going on? If yes – my email is [email protected]. Also FTP access would help. As for mixed minimum – unfortunately “Minimum Fee Value” option only accepts fixed values (but not percent). I’ll have to re-check if this can be added – will try to add it in next plugin version. P.S. We had a similar issue and the problem was in a compatibility issue with one of these plugins: “Simple Sales Tax”, “WooCommerce Services” or “Taxjar”. Could you please let me know if you have any of these plugins installed on your server? HI Tom, thanks no i am not using one of the plugins , but for unknown reason it is working now. Which is good. However what i have noticed now is that e.g. it does not seem to work that card fees are applied to products if a product without card fees is in the cart. e.g. I have a product (membership) which is excluded from the cardfee (memberships) – (membership is in a category excluded from the cardfee calculation.- ok (no fee applied) . Other products the card fee is applied (ok) – But if a membership is in the card together with other products => no card fee is applied for all – I would expect that the card fee of those products is applied which are not excluded. Appreciate your feedback. I think what you need to do is go to your fee’s settings (e.g. “WooCommerce > Settings > Payment Gateway Based Fees and Discounts > Direct bank transfer”) and there (at the bottom of the settings page) there is “Product Categories – Calculation type options” – please try changing that from “For all cart” to “Only for selected products”. Although I have used the plug-in in the past with no problems at all, it doesn’t seem to work properly after I updated some of the other plug-ins I work with. I checked and re-checked all of the settings multiple times, but the payment gateway fees just don’t show up at checkout. Product prices remain unchanged when switching payment methods. I am running out of ideas as to why things suddenly stopped working (I didn’t change any of the settings before and after the update). I’m building a new website and am interested in your plugin to charge a fee for using a credit card over a $ threshold, I was wondering, what is the difference between the Free and Premium versions? The descriptions for both seem to be nearly similar. How to resolve this issue? Can you incorporate a fix in the next release?…. Maybe I could login to your site (WP and preferably also FTP) and check it? If yes – my email is [email protected]. Hi, urgent help required please! I’ve enabled fees for both paypal express checkout and paypal rest card payments. The fees calculate perfectly in the checkout page, however when the customer clicks through to buy, they are removed when they get to paypal. Why are the fees being blocked/removed by paypal? Thank you for sharing the error and letting us know that you are using the latest version of the plugin. I have tried to replicate the issue on our staging site with the latest version 2.5.4. But I am unable to replicate the issue as the checkout page is working fine nor any errors are recorded in the debug.log file. Can you please let me know whether you have tried by switching the currently active theme to the default WordPress theme or the StoreFront theme? If no, then can you please try and let us know whether the mentioned issue is fixed. If the issue still persists then try by deactivating all the plugins except WooCommerce and the Payment Gateway Based Fees and Discounts for WooCommerce plugin and let me know the result. Yet the issue persists then please send us the admin details of your site at support at tychesoftwares dot freshdesk dot com. We shall check the issue and get back to you with an update. 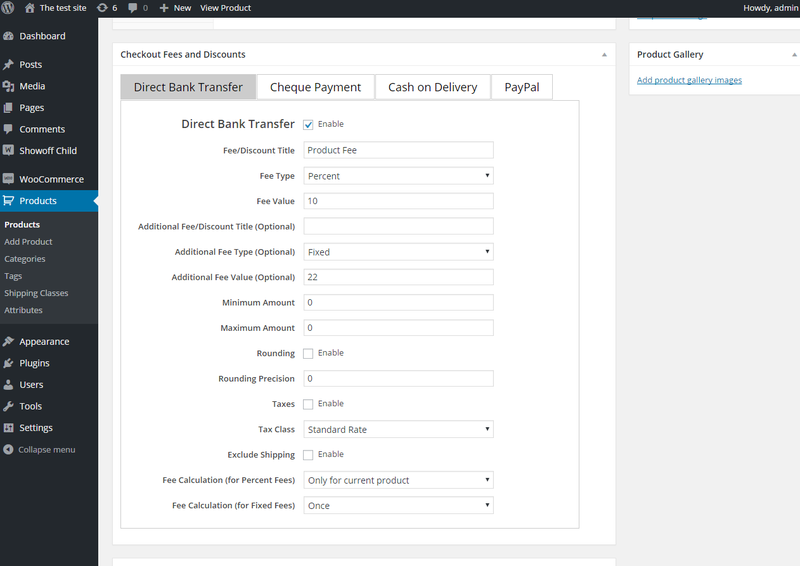 You will need to enable the setting “Payment gateways fees and discounts on per product basis” from the plugin’s settings under WooCommerce -> Settings -> Payment Gateway Based Fees and Discounts page: https://screencast.com/t/SciyFw5kkM . I believe the key I entered is correct though it doesn’t say so in settings. 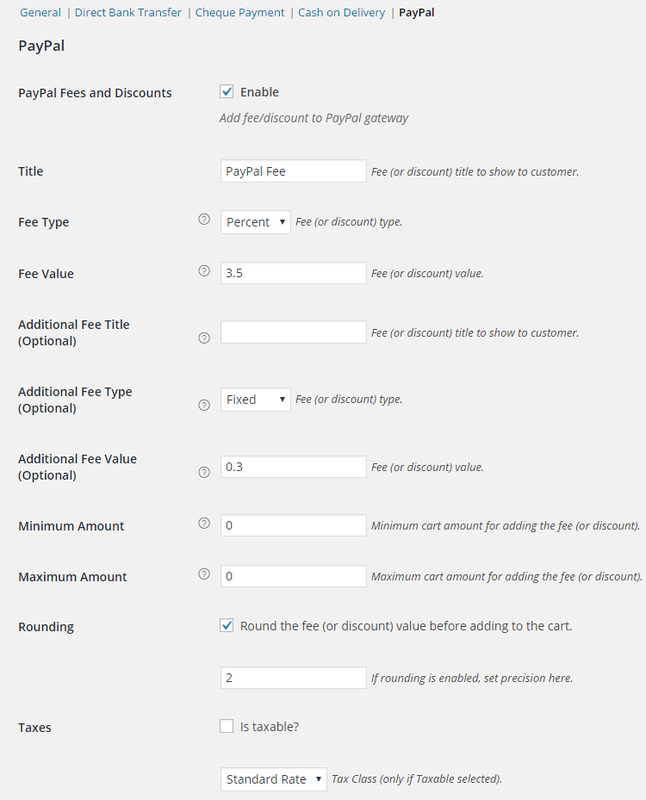 I have enable the setting “Payment gateways fees and discounts on per product basis” from the plugin’s settings under WooCommerce -> Settings -> Payment Gateway Based Fees and Discounts page: https://screencast.com/t/SciyFw5kkM . When I select a product, I CAN see the per product settings to enable or disable certain payment gateway. BUT, those selections ( enabled/disabled ) or overwrite the amount do NOT get reflected in the cart. Can you please help ? I have created a ticket for you on our ticketing system. Can you please check and reply on that ticket? Hello. I have the pro version of the plugin (latest version). I have configured a convenience fee for the credit card gateway method that EXCLUDES a specific category of products. When I add a product from the excluded category to the cart, the convenience fee is NOT added however if I add a second product from another category (that is not excluded), there is still no convenience fee. It seems that the presence of a product from an excluded category removes the convenience fee altogether even if there are other products that should be subjected to it. The correct functionality should be that a convenience fee is added to qualifying products even if there are excluded products in the cart. we have a recurring paypal but the fee is not calculated. How gets this working? * Added compatibility with WooCommerce Subscriptions. * Fixed an issue where license key was not being activated successfully. * The plugin goes into continous loading of the cart at Checkout when precision is left blanks for rounding. Fixed the same. * Added uninstall.php file to ensure the plugin data is deleted when the plugin is uninstalled. * On a fresh install of the plugin, the admin will now be prompted to enter the license key and activate the same. * Dev - Current (i.e. chosen) payment gateway function rewritten (fixes the issue with 100% discount coupons on the checkout page - fees were not reapplied when coupon is removed). * Fix - Coupons usage with "WooCommerce Gift Certificates" plugin fixed. * Fix - Settings hook priority increased, so gateways fees settings are not loaded too early (fixes the issue with "Mollie Payments for WooCommerce" plugin). * Fix - Product categories - Calculation type - Categories to exclude - Only for selected products - Option fixed. * Dev - "States to include/exclude" options added. * Dev - Major code refactoring and clean up. Main plugin file and POT file renamed. * Dev - "Reset section settings" options added. * Dev - Raw input now allowed in all "Info" section templates. * Dev - "Merge All Fees" added to "General" section. * Dev - "Global Extra Fee" added to "General" section. * Dev - Current (i.e. chosen) payment gateway function rewritten (fixes the issue with "zipMoney" payment gateway). * Dev - "Customer Countries" options added to both fees separately. * Dev - "Europe", "European Union", "Europe excluding EU", "Eurozone", "Africa", "Asia", "Australia and Oceania", "Central America", "North America" and "South America" added as country selection. * Dev - Eight more countries added to the list. * Dev - "Info" admin settings section added (options moved from "General" section). * Dev - Plugin link updated from https://wpcodefactory.com to https://wpfactory.com. * Dev - Additional check added in Alg_WC_Checkout_Fees_Settings_Gateways (prevents AJAX error on some servers). 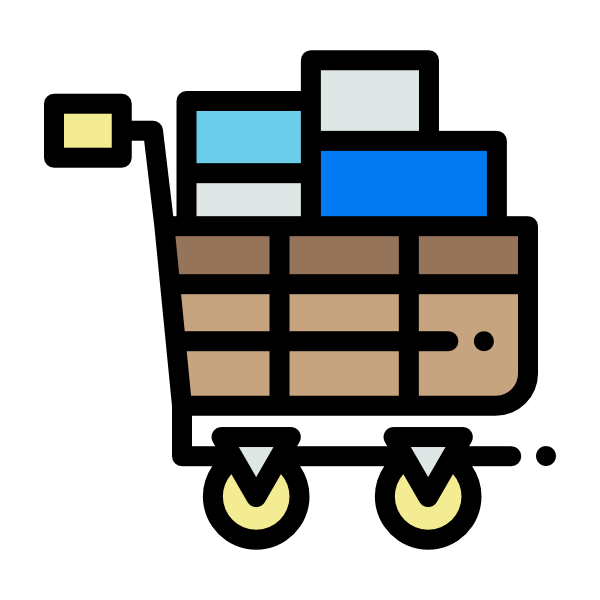 * Dev - WooCommerce 3.2 compatibility - WC_Tax::get_tax_total() replaced with get_cart_contents_taxes() and get_shipping_taxes(). * Dev - Additional check for WC()->payment_gateways to be set, added in add_gateways_fees(). * Dev - Additional checks for tax class to exist added (in Core and Info). * Dev - Additional checks if product's price is zero added (in Info). * Dev - Per products settings JS file updated. * Dev - Info - %product_price_diff_percent% replaceable value added. * Dev - Wrapping div (class alg_checkout_fees) added to meta box settings. * Dev - "General" settings restyled. * Dev - "Aelia Currency Switcher for WooCommerce" plugin currency conversion filter added to: get_max_ranges(), min_cart_amount, max_cart_amount, min_fee, max_fee, min_fee_2, max_fee_2. * Dev - "Coupons Rule" options added. * Dev - Settings restyled. * Fix - Removed additional check if add_gateways_fees() has already been executed (was added in v2.2.1). * Dev - "Delete All Plugin Data" option added. * Dev - Code cleanup etc. * Fix - Per Product - custom_atts for fields (step etc.) fixed. * Fix - Additional check if add_gateways_fees() has already been executed added (this prevents fees duplicating on some servers). * Dev - WooCommerce 3.x.x compatibility - Deprecated get_price_excluding_tax(), get_price_including_tax(), get_display_price() notices fixed. * Dev - WooCommerce 3.x.x compatibility - Deprecated get_formatted_variation_attributes() notice fixed. * Dev - WooCommerce 3.x.x compatibility - Deprecated get_country() notice fixed. * Dev - "Add Taxes" option added for both global and per product fees. * Dev - Plugin header updated ("Text Domain" and "Domain Path" added). * Fix - Bug when local and global fees have same title, fixed. * Fix - Categories restrictions wrongly applied to per product fees, fixed. * Dev - "Max Range Options" options section added to "General" settings. * Dev - "Override Global Fee" (main and additional) option added to per product settings. * Dev - "Minimum Fee Value", "Maximum Fee Value", "Minimum Additional Fee Value" and "Maximum Additional Fee Value" options added to both local and global fees. * Dev - "Minimum Cart Amount" and "Maximum Cart Amount" options title modified. * Fix - Tax bug fixed when "Categories to include - Calculation type" is equal to "Only for selected products". * Fix - Tax bug fixed in info. * Fix - "Categories to include - Calculation type" with value "Only for selected products" fixed when displaying info. * Dev - "Categories to exclude - Calculation type." option added. * Dev - "Categories to include (additional fee)." and "Categories to exclude (additional fee)." options added. * Dev - Author changed. * Fix - sanitize_title() added to add_gateway_fees_settings_hook() and removed from output_sections(). * Dev - "Variable Products Info" option added. * Dev - "Categories to include - Calculation type" option added to global fees. * Fix - Additional checks in add_gateway_fees_settings_hook(). * Fix - Checked tab in admin per product fees is marked now. * Fix - Info on Single Product bugs fixed: for variable products; for percent fees. * Fix - "General" section in admin settings menu is marked bold by default. * Dev - %product_title%, %product_variation_atts% added. * Dev - Info on Single Product - [alg_show_checkout_fees_full_info] and [alg_show_checkout_fees_lowest_price_info] shortcodes added. * Dev - Info on Single Product - Lowest Price Info on Single Product Page added. * Dev - Info on Single Product - %gateway_fee_title% and %gateway_fee_value% removed from info. * Dev - "Add Product Title to Fee/Discount Title" option added to "General > Fees/Discounts per Product" settings. * Dev - "Hide Gateways Fees and Discounts on Cart Page" option added to "General" settings. * Dev - "Exclude Shipping" option added for both global and per product fees. * Dev - "Title" option added for optional "Additional fee" (per product and global). * Dev - "Customer Countries" (include / exclude) options added to global fees. * Dev - "Product Categories" (include / exclude) options added to global fees. * Dev - Compatibility with "Aelia Currency Switcher for WooCommerce" plugin added (for fixed fees; for percent fees compatibility was already there). * Dev - "Fee Calculation (for Fixed Fees)" options (once / by product quantity) added to per product fees. * Dev - "Fee Calculation (for Percent Fees)" options (for all cart / by product) added to per product fees. * Dev - Second optional fee added. * Dev - Checkout fees/discounts info on single product frontend page added. * Dev - Checkout fees/discounts on per product basis added.